Building on progress achieved through the Every Woman Every Child movement, the UN Secretary-General launched in September 2015 an updated Global Strategy for Women’s, Children’s and Adolescents’ Health (2016-2030) to help further the Sustainable Development Goals. The Global Strategy is a bold new roadmap for ending all preventable maternal, newborn and child deaths, including stillbirths, by 2030, and improving their overall health and wellbeing. It aims to keep women, children and adolescents at the heart of the sustainable development agenda, unlocking their vast potential for transformative change. The Global Strategy is universal and applies to all people (including the marginalized and hard-to-reach), in all places (including crisis situations) and to transnational issues. It focuses on safeguarding women, children and adolescents in humanitarian and fragile settings and upholding their human rights to the highest attainable standard of health, even in the most difficult circumstances. 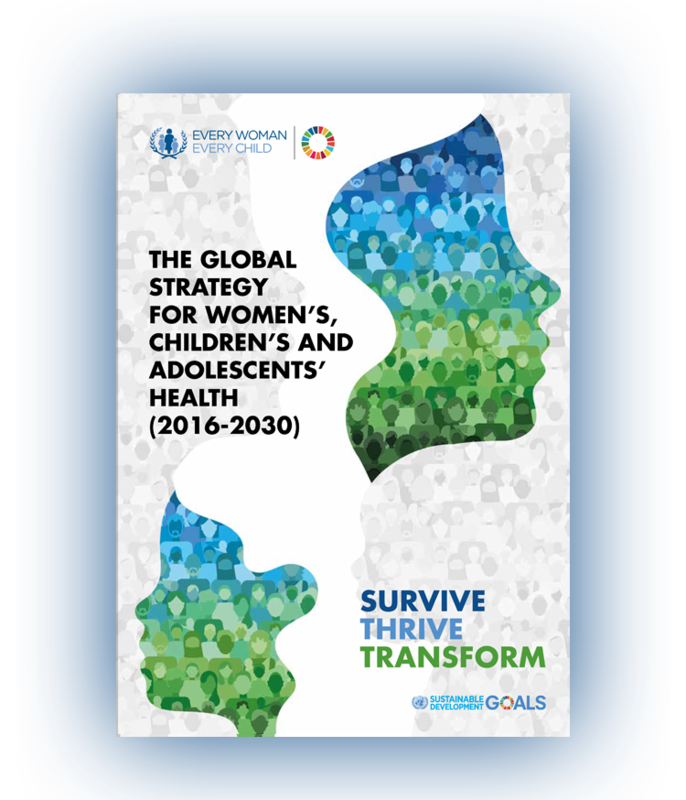 For the first time, adolescents join women and children at the heart of the Global Strategy. This acknowledges not only the unique health challenges facing young people, but also their pivotal role alongside women and children as key drivers of change in the new sustainable development era. The Global Strategy takes a life-course approach that aims for the highest attainable standards of health and wellbeing—physical, mental and social— at every age. A person’s health at each stage of life affects health at other stages and also has cumulative effects for the next generation. The Global Strategy also guides greater integration among actors in the health sector and across other sectors such as nutrition, education, water, hygiene and sanitation, and infrastructure, bringing together multi-stakeholder partners and combining innovative financing and accountability mechanisms to help achieve the SDGs. An Operational Framework has been developed to accompany the Global Strategy for its first five years, to be updated every five years through 2030. The Operational Framework, developed in consultation with governments, civil society, the private sector, international agencies, and other constituencies and partners, will guide countries as they develop and refine their plans for women’s, children’s and adolescents’ health based on country-identified needs and priorities. In addition, the Global Strategy Indicator & Monitoring framework will support countries and integrate into SDG follow-up and review process at country, regional and global levels.To support country monitoring that is meaningful and actionable from the start, and to identify priorities and gaps, EWEC partners developed a 2016 report on worldwide readiness to monitor the Global Strategy indicators. Over 50 countries and 120 organizations have already made official commitments to the Global Strategy, pledging over $25 billion to women’s, children’s and adolescents’ health. Implementing the Global Strategy, with increased and sustained financing over the next 15 years, will yield tremendous returns. Visit the GLOBAL STRATEGY site.